It's Tuesday. I survived Monday. That was not easy -- it was a bad one that turned into a good one, though very emotional from start to finish. And there was even a scary moment. I actually fell asleep on the drive home last night! It was probably only 3 seconds, but it was enough to have veered into the lane next to me, not to mention stopping my heart completely. Thank God for no cars around me at that moment on a very busy highway. I immediately hit the bluetooth button and called my friend Mark to help me wake up. (Still no sign of baby -- mom is 1% dilated, though!) Anyway, I was wrecked last night and would have slept 9 hours if it were not for this pair. No complaints -- they're such a wonderful part of my life. But sometimes I don't want to be nuzzled with a nose at 12:10am for no good reason. Water? Check. Bathroom break? Check. No, you can't run around the house at your leisure in the middle of the night. You, of the two colored eyes, who chewed up my expensive hair brush and have stolen things off the counter. You will sleep in our bedroom at night, and you will like it! It was a wonderful weekend, by the way. Time with friends is always appreciated -- especially with these ladies. (DK, JA, K2, LH, Ro, TH, yipsy, JD, RW -- you know who you are.) My best girlfriend arrived Thursday afternoon, and it felt like two seconds later I was taking her back to the airport yesterday. 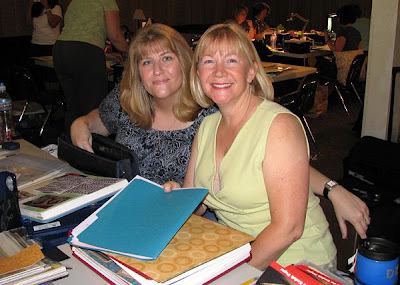 Somewhere in between, we had a wonderful time visiting with everyone and scrapbooking. I miss her so much already, but we're working on the next get together already. Vegas, baby! Thanks to everyone who made this weekend a success. I'm glad to have each and every one of you in my life. To everyone else -- if you aren't a scrapbooker yet, you should be! It was a wonderful weekend, and it sure felt like I haven't been gone for close to 2 years already! I'm sure glad to have all these wonderful women in my life! 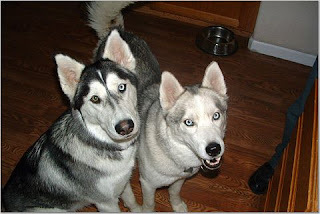 Look at those husky angels, they would never give nose nuzzles at midnight while you're trying to sleep! Nope, not huskies!